Cancellations free of charge are possible 7 days before your arrival to the hostel, after this period the full amount of your balance will be charge. We cannot accept cancellations on your arrival, the full amount of your balance will be charge. Please confirm your security deposit on your arrival to the hostel. All guest leave a deposit during their staying. 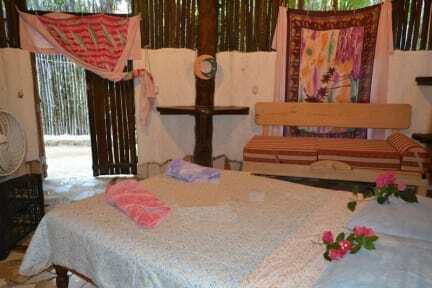 Posada los Mapaches provide the service B B & B (Bike, Bed and Breakfast) included in the price!!! 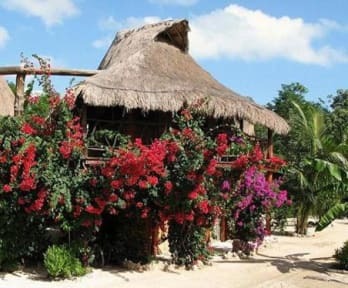 Just across from the entrance Tulum Ruins;, if you like the nature contact come.. relax.. and enjoy this beautiful place and all the great locations around.. ...Ruins, beach, cenotes and more.... You will love it! Electricity and hot shower 24 hrs. NO PARTIES ALLOWED INTO THE PROPERTY OR ROOM. Please: Advise your arrival time by email. Check out at 11.30 am. Check in from 15:00 hrs. to 21:00hrs. Wir waren vor Jahren schonmal hier und es hat uns so gut gefallen, dass wir zurück kamen - wir wurden nicht enttäuscht! Ein wundervoller Ort, irgendwo zwischen Hotel, Hostel und einem Zuhause. Die Inhaberin ist fantastisch und nimmt sich für jeden ihrer Gäste geduldig Zeit, um sie über die Highlights in und um Tulum zu informieren. Die Zimmer sind super, die Anlage ist wie eine kleine, top gepflegte Dschungel Oase, das Frühstück ist home made, frisch und jeden Tag anders. 100%ige Empfehlung!!! For sure one of the cleanest & best maintained places I stayed during my travel in Mexico. The owner (Chelo) is a warm,helpful person with a big heart and also her son & the rest of the stuff are very friendly. The garden is very nice and relaxing. The breakfast is amazing! (Chelo is also an excellent cook). The hostel is not in the town,but located in the middle of Tulum and the Ruins,but with the bicycle for free you will need only 10 min. in both directions. Muchas gracias for the great stay! Just as everybody else said - the place with its amazing treehouses is lovely, Chelo and the rest of the staff are lovely, it’s lovely that you get to rent a bike for free and you’re very close to the ruins and the beach, so it’s easy to be there early. I didn’t find the noise annoying and I even kinda liked the fact the you need to go to town by bike (a bit of sports before eating another load of Guacamole :)). My room was super pretty and comfy and clean. Tolle Atmosphäre, nette hilfbereite Gastgeberin, super Frühstück. Das wirklich einzige Manko ist die Lage direkt an der Straße, aber wenn man sich darauf eingestellt hat ist es toll! Cute family run hostel. Bikes are super useful. Delicious cold and warm breakfast. Gets loud at night, due to its location right at the carretera. Wasn't possible to store bags after check-out.